Anchor's second Elysia, sister of Castalia (II), was built by D. & W. Henderson, of Glasgow. She was launched in August 1908, and, except for one Glasgow-Boston sailing in 1919 and one Glasgow-New York sailing in 1922, remained on Anchor's Indian service for her entire career. According to Haws, Elysia was the most frequently attacked British merchant vessel of World War I. She was attacked unsuccessfully four times, but the fifth attack on 25 May 1918, resulted in 13 deaths and required ten months of repairs to the ship. 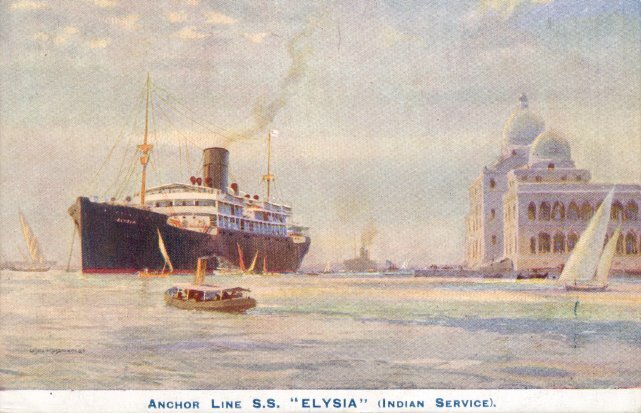 She was not nearly so fortunate during World War II, for on 6 May 1942, Elysia was torpedoed and sunk by two Japanese surface raiders 350 miles off Durban while en route from Glasgow to Bombay.